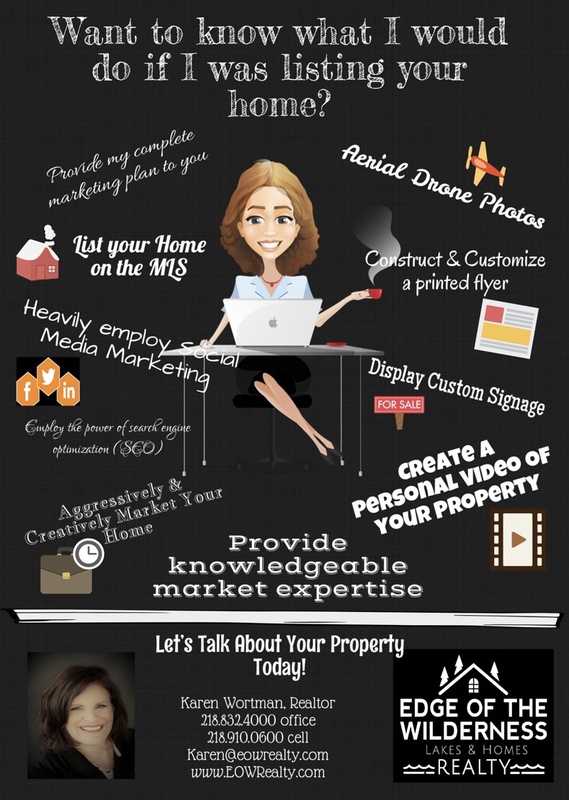 If you’re ready to list your home, vacation property, or land for sale, it’s important to find a Realtor that has a solid marketing plan in place. If your Realtor’s plan is to stick a sign in the yard and list your property on the MLS; then sit back and wait for potential buyers, that’s NOT a marketing plan. There’s so much more involved in marketing! Social Media: I heavily employ Social Media including Facebook, Twitter, Instagram, and LinkedIn. Let’s face it, people are all over Social Media these days and its a great way to have your property shared throughout a network. Aerial Drone Photos/Videos: At Edge of the Wilderness Realty, we have a licensed Drone Pilot on staff. For lake home/cabins and raw land, having Drone photos can really show off the location of your property, the lake view, and make your property stand out from the crowd. Professional Photographs: We also have a professional photographer on staff at Edge of the Wilderness. You’ve seen some listings on the internet where its hard to tell if they home is nice or not because the photos are so bad. That doesn’t happen here! I invest in your home, cabin, or land. Employ SEO techniques: SEO is short for search engine optimization. I know, its one of those things that a 13 year old knows all about but those of us not of the computer age are pretty clueless. Basically, I research terms that come up when people search the internet. Then I incorporate those terms into the description of your property. So when someone is searching for “lake property in Itasca County”, your property comes up in their search. Networking: The first thing I do when I have a new listing is share with all of the agents at Edge of the Wilderness Realty. Each agent has their own clients and quite often, one of us is already working with someone that would love your property. Groups/Organizations: Being active in the community means getting to know a lot of folks. I sit on the board of the County Extension office and the 318 Endowment Foundation. While community service is important to me personally, it also allows me to share what is going on in Real Estate. Unique Advertising: Gone are the days where we simply list property in the Sunday newspaper. Research has shown that less than 1% of home buyers find their property in the newspaper. Rather than wasting money on the Sunday paper, I use other print media like Minnesota Outdoors or The Woods Reader. These magazines focus on those people who LOVE Northern Minnesota. Website Advertising: Your listing will show up on over 80 websites! The most popular sites include Zillow, Trulia, & realtor.com We also have agreements with other Real Estate Companies so it would not be unusual for a buyer’s agent at Century 21 or ReMax to find your property during their search. This is all good news! More exposure! Each property that I list is unique, so I create a unique marketing plan just for your property. Give Edge of the Wilderness Realty a chance to show you the difference. Love Where You Live!